Applies a puzzle like effect to an image. 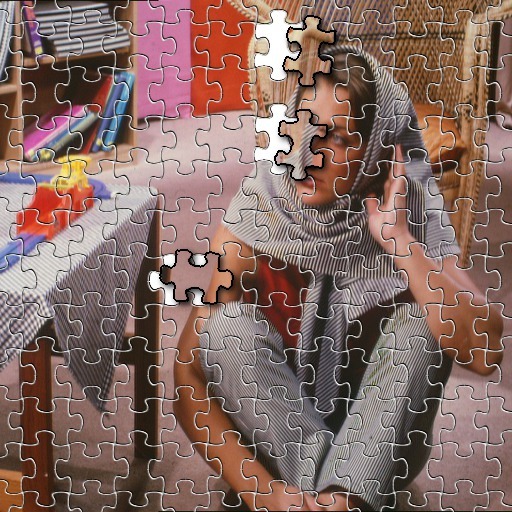 PURPOSE: To apply a puzzle like effect to an image. DESCRIPTION: PUZZLE applies a puzzle like effect to an image. Options include: setting the number of missing pieces, setting the missing piece color and the outline color and overlaying the missing pieces at some rotation or offset. -s scale ... SCALE is the puzzle cell scale factor. Values are integers>=50. The default=100. At scale of 100, the size of a cell is about 50x50 pixels. -o ocolor ... OCOLOR is the puzzle piece outline color. Any valid IM color is allowed or the special value of "carve" (without the quotes). The default=gray40. Using carve will produce a carved-like effect to the puzzle. The default=gray40. -e ecolor ... ECOLOR is the color used to fill empty (missing) pieces. Any valid IM color is allowed. The default=white. -m missing ... MISSING is the number of missing (empty) pieces. Values are 0<=integer<=20. The default=0. -n newseed ... NEWSEED is the seed for random missing pieces. Values are non-negative integers. The default is no seed. Thus the pattern will not be repeatable. -r rotate ... ROTATE is the rotation angle of overlaid missing pieces. Values are -360<=integer<=360. The default=0. Pieces will not be overlaid unless at least one of rotate, xoffset, yoffset are non-zero. -x xoffset ... XOFFSET is the x offset of overlaid missing pieces. Value are integers (positive or negative). The default=0. Pieces will not be overlaid unless at least one of rotate, xoffset, yoffset are non-zero. -y yoffset ... YOFFSET is the y offset of overlaid missing pieces. Value are integers (positive or negative). The default=0. Pieces will not be overlaid unless at least one of rotate, xoffset, yoffset are non-zero. -O opacity ... OPACITY for shadow effect on overlaid missing pieces. Values are 0<=integer<=100. The default=0. -D depth ... DEPTH for shadow effect on overlaid missing pieces. Values are integer>=0. The default=3. -L length ... LENGTH of shadow on overlaid missing pieces. Values are integer>=0. The default=3. Requirements: IM 6.5.9.3 or higher due to the use of 1D morphology edge. previous image and composites it with the rotated/offset image with ocolor to add the outline. convert -quiet -regard-warnings "$infile" +repage "$tmpA1"